Distracted driving, such as driving while texting or talking on a hand-held cell phone, accounts for numerous collisions on the roads in Manchester and the surrounding area. If you have been hurt in a car accident due to a distracted driver, Attorney M. Jeanne Trott can help you understand your legal rights and options. Her experience as a former nurse provides her with a detailed understanding of the injuries that victims can suffer. Attorney Trott has over 25 years of experience asserting their rights in a wide range of circumstances. New Hampshire has banned text messaging while driving, and as of July 1, 2015, it will be against the law throughout the state to use a hand-held cell phone while driving or stopped in traffic. All drivers are required to follow these rules. Breaking these laws can expose a person to a lawsuit if his or her behavior results in a car accident and resulting injuries. Negligence is the basis of many car accident legal claims. A driver is legally at fault for an accident if they are shown to be negligent, or careless, in their behavior. Breaking vehicle safety laws and driving unreasonably are likely to be deemed negligent acts by a court. To bring a personal injury lawsuit against a negligent driver, the accident victim, or plaintiff, first would show that the defendant driver owed him or her a duty of care. Second, it must be shown that this duty was breached. This breach must have been the direct cause of the accident and the injuries that resulted. In the case of a distracted driving car accident, perhaps the defendant driver was holding a phone and chatting, failing to pay attention to the road. If this caused a collision with another car, injuring someone else in the process, he or she may be held liable under a negligence theory of law. While distracted driving may be the cause of many accidents, behavior surrounding the use of a cell phone may also be found careless, even if the driver is not directly using the phone. 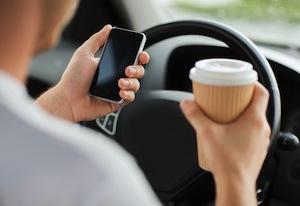 Courts have held that taking eyes off the road to reach for a cell phone, or being distracted by a passenger’s cell phone use, is negligent driving. However, a crash victim can be held partially responsible for the accident if he or she was driving distractedly at the time of the collision. Under the modified comparative fault rule, the court will consider the proportion of fault for each person involved in the accident. Victims of distracted driving collisions may be able to recover damages for their injuries. As part of their negligence claim against the defendant driver, they may seek both economic and non-economic compensation. Medical expenses and wages from missed work should be carefully documented because they can potentially be recovered. Non-economic damages like pain and suffering and emotional distress, often may also be recovered after a car accident. Car accidents can result in serious injuries that have life-long consequences. If you or a loved one has been hurt anywhere in New Hampshire as the result of distracted driving, contact injury lawyer M. Jeanne Trott to discuss your potential legal rights. She serves clients in communities across the state, including Goffstown and Nashua. Attorney Trott can be reached at (603) 624-7500 or by an online form. The first consultation is free, so there is no risk in taking the time to explore your options.